Barnabas, retransformed by the Leviathans into a vampire, and after nearly biting Maggie, attacks one of their newly minted cultists and then burns the Todds’ antique shop to cinders with Jeb inside. Jeb made a mistake. And this is why we watch Dark Shadows. Yes, yes, it’s a profound meditation on, you know, love and the past and the existential conundrum of culpability versus intent. 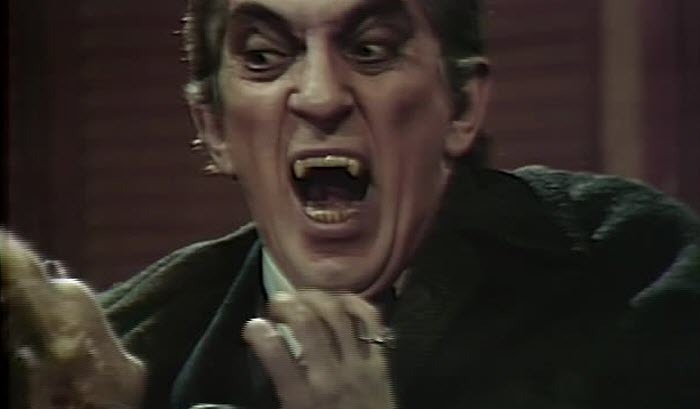 And we just as much want to see Barnabas Down to Bite, and this episode is a hullabaloo. Perhaps extending into the realm of hootenanny. Barnabas appears at all corners of the moral map in the series, from sinister to savior, but it’s generally a linear progression. Out of step with this, the Leviathan arc’s depiction of him is incredibly mercurial, and no matter how we’ve see him improve, they still play the monster pedal. But even within the arc, there is a progression. Until there isn’t. Rarely has the series had it both ways with such elegance and efficiency. Here, in 951, he’s a feral and ferocious vampire and a tragic hero, all at once. Cosmically, I blame (and credit) David Selby. Now that there’s another central hero to the series, Barnabas can be the bad guy. But since we’ve seen him go from bad guy to good guy, once, and know his tragic origin, it just won’t stick to have him be completely evil. That’s a job for Nicholas Blair. 451 reestablishes the precarious balance that’s essential to the character. And it does it theatrically as hell in an episode that’s determined to entertain the audience whether they want to only see a boring soap opera or not. Turning Barnabas back into a vampire is fine. Having him attacked by a bat that comes out of a demonic box in the fiery realm of a snake-god temple? That’s great television… and maybe great art, too. There’s a dizzying amount of variety that follows. Barnabas has a one-man vaudeville routine outside Collinwood where he decides to bite Maggie, talks himself out of it, then back into it, then back out of it as he nears the door. I’m vaguely surprised they didn’t let Quentin and Jeb have the rest of the episode so they could cut back to Barnabas see-sawing on the issue for the next ten minutes. But it’s all too much, and he needs a drink at the Blue Whale. Just as he’s courting a conspicuously dixie doxie who’s wandered in from a Horton Foote-written episode of True Blood, Julia and Quentin show up at the ‘Whale and Barnabas tries to ditch them. For good reason. Not only is he a terrifying vampire, but he’s killing cultists who are also terminally southern -- and who join snake cults via guys named Bruno, which makes them even more suspect. Oh, earlier, Quentin and Jeb get into yet another fight, which Jeb wins by threatening to injure Quentin’s suit. (Since Quentin’s immortal, I assume that’s the danger posed by the knife.) At this point, those boys fight more than Sonny Corleone. Jeb and Quentin either need to duel to the death or get married. But Jeb had better do it quickly, because Barnabas has had it. Torching Megan and Philip’s shop is a true, Sopranos moment, and it speaks to my favorite part of Barnabas: the one with a gas can and a match. It’s a strikingly direct solution that really speaks of the no-nonsense aristocrat from 1795. OG Patriarchy’s got stuff to do, thank you, and it has unique ways of solving problems once it’s through indulging those beatnik antique peddlers and their shaggy-haired messiah/stockboy. Mess with hegemony, feel the horns, my friend. We sometimes think of aristocrats of Barnabas’ time as fey and ineffectual fancy lads, but they had their staff ravage and savage entire continents before breakfast. There are many dualities and dichotomies to Barnabas Collins. My favorite is when he crosses the line between timidity and to-hell-with-it. It usually involves fire. Like when he goes back in time on a mission. Off to the side, Angelique seemingly lies about saving Vicki from the gallows, and Barnabas & Ben simply shrug and douse her in flames as a response. You can tell it’s therapeutic. Same thing here. Barnabas has been dragged through time, saw Josette commit suicide, had to stop using Just for Men on his temples, was manipulated by threats to Josette’s ghost, and now is a vampire AGAIN. Then there’s the whole Sky Rumson business. And taking orders from Michael and Alexander. I’m amazed that this is all he does. 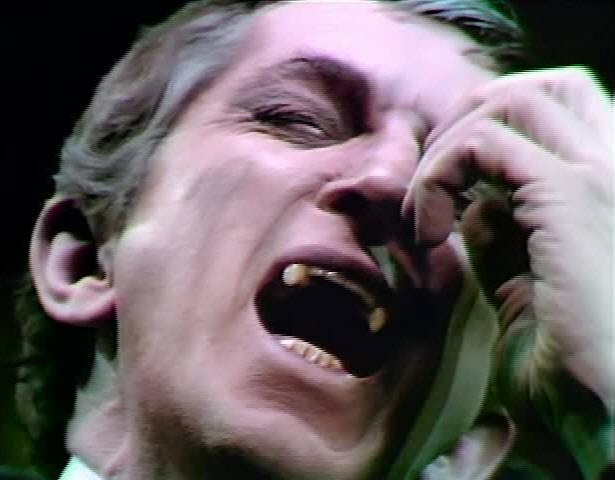 There are few things as satisfying as a fed up Barnabas Collins declaring war upon Jeb and all of the Leviathans. But Barnabas doing all those things while committing arson is right up there. This episode was broadcast Feb. 16, 1970.